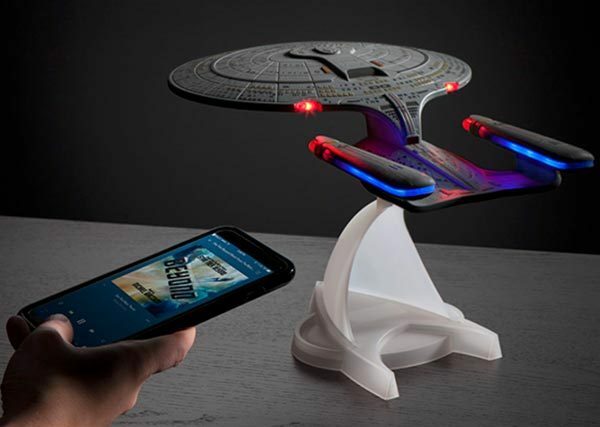 Over the decades, the Starship Enterprise has taken many forms, but this time she’s taken the form of a Bluetooth speaker. This speaker is designed after the Galaxy-class Enterprise NCC-1701-D from The Next Generation. The ship is a 12″ long scaled replica; it stands 12.5″ x 7″ tall x 9″ wide when displayed on its 2-piece stand modeled after a combadge. It connects to your mobile device or computer via Bluetooth 4.1 and has a 33ft range. Inside is a 45mm single, full-range speaker. It’s powered by an 800mAh lithium-ion battery, which charges with a DC 5V 1A source and included microUSB-to-USB charging cable. You’ll get 6-8 hours of playback time at average volume on a single charge. The ship also has LEDs on the engines, deflector dish, and saucer section; these can be turned off, if desired. When you aren’t listening to music, the speaker can play various TNG sounds: engine hum, torpedo blast, warp acceleration, and “incoming transmission” and”one minute to auto destruct” messages. You can use the engine hum sound as a white noise generator; it turns off automatically after one hour. The Star Trek TNG U.S.S. Enterprise NCC-1701-D Bluetooth Speaker is officially licensed and available for $79.99 exclusively at ThinkGeek.